The sky is the limit. Eritrea and Ethiopia can move forward by aiming high. 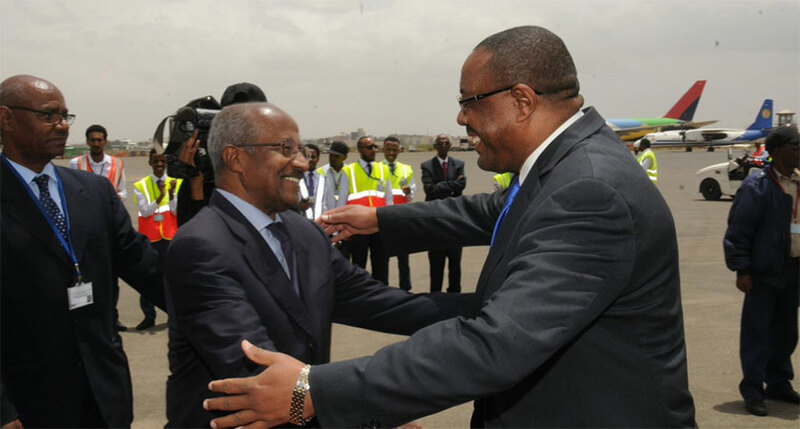 In a month where Eritreans and Ethiopians are enjoying the endless peace celebrations, former Ethiopian Prime Minister Hailemariam Desalgne was one of the dignitaries who came to Asmara with Ethiopian Airlines’ maiden flight. Q : Welcome to Asmara and thank you for your time. What are your first thoughts on your visit? I am happy to be here and conduct this interview with you; it is an honor for me. First of all, I am grateful to be in Asmara. It has always been my dream to visit, so I would like to pass my gratitude to the Eritrean government and the people for making it a reality. From the moment we disembarked from the plane, I’m still unable to find exact words to describe how I am feeling. I have walked the streets of Asmara, and people wouldn’t let me pass without hugging or kissing me. Also, I just came from a meeting with H.E President Isaias Afwerki and had a two hour conversation for the first time in our lives. All in all, this is a happy day for me. Q : Mr, Hailemariam. Would you share your thought on what can be done to strengthen the industrial activities of both countries? The two nations need to develop a strong regional cooperation and strong government unity, which can be significant. It is a fact that both countries hold an enormous amount of resources which they can benefit from. Industrial activities can be attained within both nations. For instance, it can be developed from the ports of one country. Numerous strong industrialized countries including Korea and China begun their industrial activities at their shores which are still growing fast and bigger by the day. I believe that Eritrea and Ethiopia can get an advantage from the shores Eritrea possesses. Working towards the stabilization of our markets, we need to analyze the demand of the people in both countries. That way, we can provide the people in our respective countries their needs and benefit from each other. Studies should be conducted on what Eritrea and Ethiopia can provide. Although this is just the beginning, authorities from both countries should put on efforts on this topic. A ground for full economic cooperation should be worked for. Not only do we have to focus on importing and exporting goods, but people should have the opportunity where they could be active freely. That is another essential thing we need to give attention to. Q : What are the benefits both countries could attain in connection with the Port service? Over the past two decades, both countries have lost massively in so many ways. The impasse devastated both countries economically. For instance, the northern part of Ethiopia has been using the ports of Djibouti at a high cost. We could have used the nearest port and saved expenses. As a result, the economic activities in those areas have lost massively over the years. The same goes for Eritrea. The country hasn’t properly used its ports for years which can be counted as a loss. Now, the Tourism sector in both countries would get a huge boost. The shores of Massawa are one of the most sanitary shores in the world. Tourists visit many beaches which aren’t as half clean as it. Why wouldn’t tourists want to be in the clean seas of Eritrea? Ethiopia has many places for tourist to see such as Lailbela, Aksum, and national parks; now, tourists could proceed from there to visit Eritrea and head to Massawa and finish their vacation in the seas of Eritrea and both countries would benefit from that. Another sector which both countries could get advantage from is the energy sector. Ethiopia has been able to generate its own hydro-power electricity for a while now, Eritrea could have benefited from this, which in turn could have helped cut its electricity expenses. Ethiopia has big river streams which can generate for the whole year. This could be enough for the whole of Africa let alone the neighboring countries. However, due to our conflict, we couldn’t even do the little things. Now that we are starting all over again, with peace and cooperation, we need to develop a better way of using the ports and work towards all the opportunities the two nations could profit from. We can move forward and aim high. Believing the sky is the limit; if we work hard there is nothing that can stop us from reaching our goals. Q : The start of Ethiopian Airlines, how is it going to influence the economy, tourism and social advantages for Eritrea and Ethiopia? Ethiopian Airlines is the largest airlines in the continent. It has started its flight to Asmara, and it will also fly to other parts of Eritrea as well. The flight connections through Cairo, Dubai, and Istanbul were three times expensive. The airlines have resumed its flight, it will reduce the travel expenses which the Eritreans were paying before. It is also beneficial for the Airline. For years the airlines have been losing USD $80 million annually since it wasn’t allowed to pass through Eritrean airways. The easiest and shortest way to fly to Europe and the Middle East is the Eritrean airspace and Ethiopian Airlines will definitely benefit from that. Q : In terms of enhancing interaction between both peoples, how will the two governments work towards this end? We all have seen how the Eritrean people welcomed our Prime Minister, it was indescribable. You can see how much the people carry the love. We all have witnessed how the Ethiopian people reacted when H.E President Isaias Afwerki was in Addis Ababa. This pushes you to reflect on the past two decades. People have clearly shown us that the problem wasn’t them. So, we know that reuniting the people is the first thing we should accomplish. We should prepare a platform on how to connect them through cultural exchanges, sports activities, and university connections. What role is Ethiopian Airlines going to play? How is land transportation going to be? How are Eritrean investors going to work in Ethiopia? And how will the Diaspora of the two nations invest in both countries? All this should be planned. Ethiopian Airlines brought 480 individuals during its first flight; 90% of whom are businessmen. This shows how the Ethiopian business community is ready to work here. Now that we have peace between the two countries, we all should combine our forces and work towards the ultimate development. Not only Ethiopia and Eritrea, but, Sudan, Djibouti, Rwanda, Kenya, Uganda, and Angola can be brought into the fold. We should help out each other. We should work hard to connect with our youth. Q : You just came from your meeting with the President? This is my first sit-down with the President of Eritrea. I saw him once in Qatar when I was the Minister of Foreign Affairs and assistant to the Prime Minister. Today, we talked from the heart for more than two hours. And I understood that we are both alike. If we have had the opportunity to talk before, I understood that we could have accomplished so much together. Today, we talked about how to move forward. There is nothing good that comes out of repeating the past. We have also talked about the economic cooperation of both countries and how to work together in unison. Today, I have met President Isaias Afwerki on a personal level. And I didn’t have any idea that he was this humble and respectful. The man is an extraordinary man. He even showed us who he is and what type of person he is when he was in Ethiopia. Now I know that he is a selfless person who works for his people. I am telling you this because I want to tell the world what I saw today. We are people who can’t be away from each other. The two leaders have made that clear when they met each other in both countries. There will be challenges, but we’ll work through them together.